Toward a Fabcity in São Paulo? The city of São Paulo has chosen to massively invest in creating 12 fablabs, in the continuity of telecenters that initiated people to the Internet. With 9 million reais in hand and acquired financing over two years, these more or less equipped spaces will be accessible free of charge. The rumors were true. A few months ago, they said that the mayor of São Paulo was planning to open “municipal” fablabs in the city. This political ambition was publicly expressed at the Campus Party festival in the voice of Simão Pedro Chiovetti, director of city services. While the call for tenders has not yet been published, the outline was clear from the map of 12 new fablab spaces spread out over the city. The Fabcity projects of both Barcelona and São Paulo share a common ambition in number of spaces, financed in part by public funds, but their philosophy is quite different. Barcelona’s Fabcity is the spearhead of an urbanistic and organizational renewal of the city, following Pito (Product In – Trash Out) and Dido (Data In – Data Out). The fablabs act as networked local workshops to satisfy local demand. During the Fab10 conference in Barcelona, the mayor symbolically pressed a button to make the city the first to be totally sustainable in 40 years’ time. 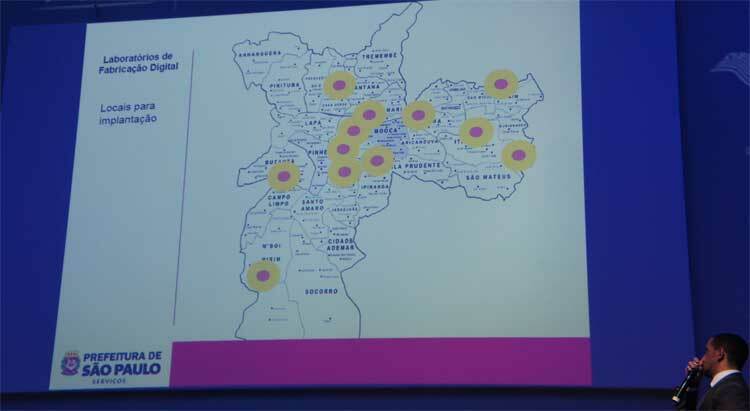 In São Paulo, during the public presentation of the project, the director of services directly linked the re-animated public network of 158 Rede publicas de telecentros (digital public establishments) to the future fablabs. As fewer people come to the telecenters, the city will capitalize on their hosting and mediation practices to convert some into fablabs. After offering its citizens free access and training to use the Internet, São Paulo will move “from bits to atoms”. In order to do this, the city is contributing 9 million reais (3 million euros) over two years, of which 2 million will go toward equipment and 3.5 million per year for maintenance. The designated spaces, spread out between richer and poorer neighborhoods, already exist; as city property, rent and utilities are already covered. Out of the 12 future fablabs, 4 will be “big labs”, well equipped with all the conventional digital machines of a fablab, in addition to more traditional tools such as vacuum forming machines. The 8 other “little labs” will have most of the standard fablab equipment, minus the routers and large laser-cutters. In terms of usage, the fablabs will pick up where the telecenters left off. People will be able to access the labs via learning modules, e-including digital fabrication. The objective of the “little labs” will be to demystify the machines through introductory classes and small projects. The “big labs” will provide 3 levels of training: short workshops for Arduino or 3D modeling, sessions spread out over several days to develop more complex projects, and even several months, tending toward what could be the Fab Academy. Its objective will be to train students on all the machines and techniques, officialized by a certificate from the city. The city believes that programming and digital fabrication skills will be among the determining factors for employment in the near future. Most likely inherited from a policy for the telecenters under former culture minister and musician Gilberto Gil, the municipal fablabs will only use open software. What’s more surprising is that everything will be free: training, workshops, laser-cutting and 3D printing services. However ambitious in means and politics, the project as presented raises several issues. For one, it will not be carried out by the city itself, but delegated to a public service, submitted to a tender offer. The problem is similar to Barcelona’s Fabcity, where the bid winners were perhaps not so familiar the ecosystem already in place. The issue is all the more important in a city where the fablab concept itself is still young. Several members of the Fab Lab Brasil association are wary of the top-down nature of the project, as much in the choice of venues as in activities. Here again, the experience of Barcelona’s Fabcity, where some fablab spaces were rejected by the local residents, challenges a policy that does not take into account future users. The top-down choices of activities are another source of worry for those familiar with São Paulo’s fablabs. The city’s plan is far from the free-for-all atmosphere of the labs and closer to an establishment dedicated to training and modest laser-cutting and 3D printing services. DIY is completely missing from the equation. Furthermore, only people who followed the long-term training will be able to use the space in the long term. Entrepreneurs and other locals with potential projects will not be able to use the fablabs for commercial projects, which challenges not only the ecosystem, but also the sustainability of these spaces. And what happens after 2018, once the two years of complete financial support from the city have elapsed? In a country where political change can be brutal when it comes to projects initiated by the previous office, as well as a newly elected mayor from the Labor Party whose mandate will expire two years from now, these issues could not be more relevant!